On a Friday evening just before Christmas, I was out shopping and talking to my 11-year-old son on the phone. “We were debating whether we should even tell you,” he said. And that meant only one thing—he should tell me. Our lab puppy had polished off a box of doughnuts, and at least half were chocolate. Rosie is my first dog; I have lots to learn, but even I knew that chocolate is a no-no. I called our vet, but the office was closed, as I had expected. The recording referred after-hours emergencies to 863-2387. And that’s how I first encountered Burlington Emergency & Veterinary Specialists, better known as BEVS. 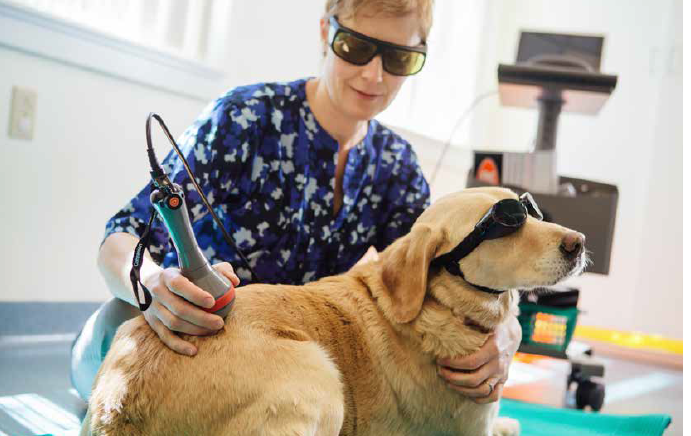 Pain Practitioner) performing laser therapy on her patient, Hobbs. Located in Williston, it’s the area’s only specialty and emergency veterinary hospital with a veterinarian on-site around the clock, seven days a week, ready to treat furry victims of trauma, toxins, and other misfortunes, and, in my case, to reassure a new dog owner that the amount of chocolate in a few doughnuts isn’t enough to hurt a 50-pound puppy. The hospital traces its roots to 1999, when a group of vets got together to provide emergency service to about a dozen veterinary hospitals in and around Burlington. Those 12 became 25, 25 became 50, and Veterinary Emergency Services, as it was known then, quickly outgrew its facility. Most of the vets working there had their own practices to run, so in late 2004, a new independent hospital called Burlington Emergency Veterinary Services was born. It moved to its current location—200 Commerce Street—in 2005 and remained a nights and weekends operation until 2007. 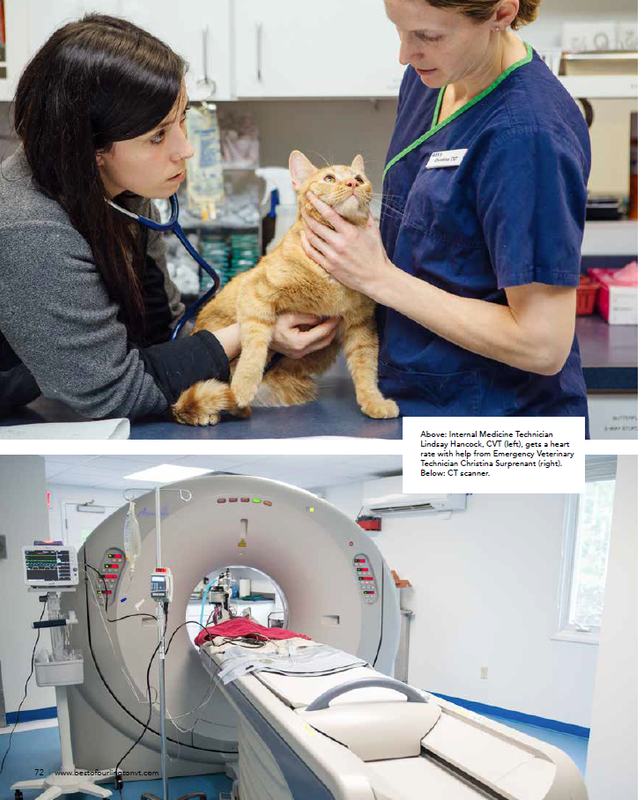 That’s when board-certified specialists joined the practice, regular daytime hours were added, and its name was tweaked to reflect its broader mission: Burlington Emergency & Veterinary Specialists. 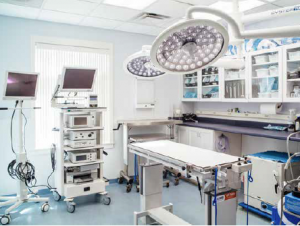 The 5,000-square-foot facility houses an operating room, radiology room, lab, and accommodations for 16 dogs and 12 cats. “For patients, we call them ‘suites,’” says hospital administrator Whitney Durivage. 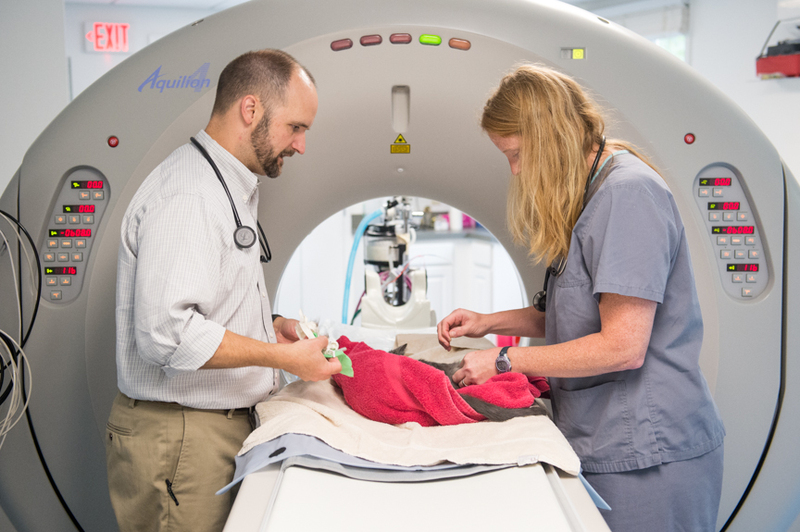 BEVS acquired the state’s first CT scanner for pets in 2013. Computed tomography (CT) is a noninvasive diagnostic method that uses special x-ray equipment to obtain cross-sectional pictures of the body. 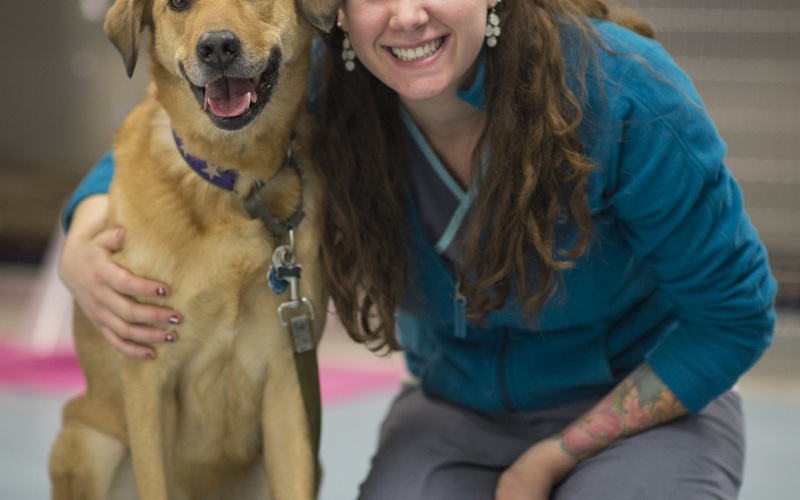 The 12 veterinarians include five emergency doctors, two surgeons, two internists, an oncologist, and the state’s only certified veterinary pain practitioner, who offers acupuncture and laser therapy and can fit dogs for prosthetic legs. The doctors work with 30 veterinary technicians that BEVS calls nurses. Dr. Bryan Harnett talks about recent cases he and his team have treated, which include a cat with Cryptococcus, a fungal infection of the brain, and an eight-year-old lab that couldn’t move its legs. The dog had a slipped cervical disc, which a surgeon removed using a ventral slot procedure. In addition to chemotherapy, endoscopy, cystoscopy, rhinoscopy, and echocardiography, the hospital offers that all-too-common emergency procedure— retrieving objects that animals have swallowed. These have included bottle caps, needles, fishhooks, a golf ball, a tennis ball, a spoon, socks, and undies. 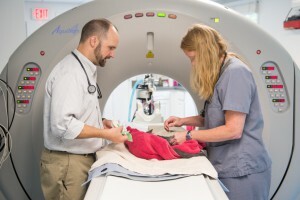 CVT, VTS (Internal Medicine) perform a CT scan on a feline patient. Two electronic boards—one listing inpatients and the other listing appointments and walk-ins—hang in the center of the treatment area where, on a recent Monday, vet techs took turns cradling a pug puppy who had been vomiting and not eating. “This is a four-month-old puppy, and he should be loud and rambunctious, but he’s not at all,” said vet tech Katie Henderson. For all the sophisticated equipment and procedures here, animals awaiting diagnosis are tagged with a decidedly unacademic acronym—ADR, for ain’t doin’ right. Tests showed that the lethargic puppy had low blood sugar and elevated liver enzymes, leading the team to suspect it had a liver shunt, a blood vessel that carries blood around the liver rather than through it, allowing toxins to build up. The patient population here is 60 percent dogs and 40 percent cats, administrator Whitney says. Hamsters, gerbils, and rabbits come in on an emergency basis. While most clients live in Chittenden County, some travel from Southern Vermont, Upstate New York, and New Hampshire. The day BEVS treated the ADR puppy, David Snider made a trip of an hour and 50 minutes from Lake Placid, New York, with his four-year-old pit bull mix, Roger, who was nursing wounds from a porcupine fight. “He won the battle but lost the war,” David said. Roger had bested his opponent 10 days earlier but was now feverish, lethargic, vomiting, and exhibiting an abscess under his left leg. His Lake Placid vet suspected he’d need a CT scan, and since she doesn’t have the equipment, she sent him to BEVS. Dr. Maggie Lynch ran blood tests and suggested admitting Roger. Elsewhere in the hospital, a black lab and a hound mix rested in adjacent cages. The dogs, from the same home, were receiving fluids while under observation for suspected Xylitol ingestion. The artificial sweetener found in gum and peanut butter is toxic to dogs. “And sometimes, if you don’t know who ate it, you end up having to treat both,” Whitney says. The same thing happens with cats and lilies. Veterinary Pain Practitioner) works on balance and core strength with Hobbs. Awaiting surgery was a 4½-year-old small mixed-breed patient who had been hit by a car. Dr. Helia Zamprogno planned to insert plates into the dog’s two broken hips and pins into her broken tibia. Dr. Pam Levin would be available to help after surgery. 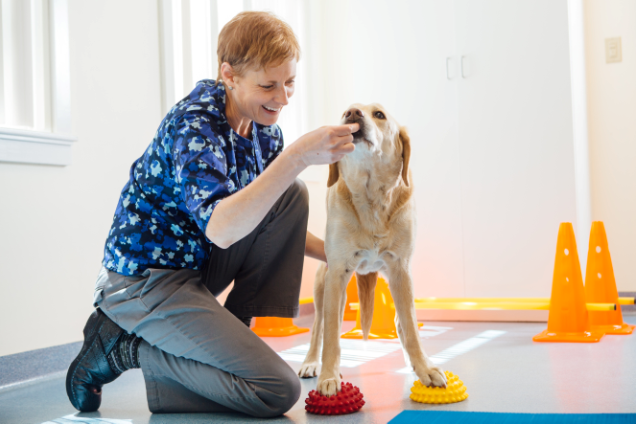 She is the hospital’s certified canine rehabilitation therapist—think physical therapy for dogs. She employs exercise balls, BOSU balance trainers, and cavaletti rails to help pets strengthen their muscles and improve their balance, gait, and body awareness. And yes, she says, patients go home with exercise regimens. “Everyone gets homework.” Dr. Levin also offers acupuncture, which doesn’t surprise people, she says. “Lots come in looking for it because they have it for themselves or they’ve heard about it.” Chinese practitioners used it on horses 2,000 years ago, Dr. Levin says. “We don’t really call it alternative anymore; we call it adjunctive therapy.” She uses it mostly to relieve pain for animals that are older, arthritic, or have mobility problems. Sarah Lehto brings her 12½-year-old border collie, Sadie, to Dr. Levin for routine laser therapy to treat arthritis. The procedure delivers light energy to areas of pain and swelling to increase blood flow, stimulate healing, and decrease pain and inflammation. When medication wasn’t enough for Sadie, Sarah decided “somewhat skeptically,” she admits, to supplement it with laser therapy. Sadie regained her sass as well as her interest in walking and swimming, Sarah says, and she’s been receiving laser therapy ever since. “I call it the spa treatment,” says Sarah. The doughnut incident was the first of three contacts this writer has had with BEVS. On Easter Sunday, English lab Rosie ate the contents of an Easter basket. That amount of chocolate tipped the toxin scales, and BEVS advised inducing vomiting. Rosie lapped up hydrogen peroxide—labs will eat anything—then promptly returned the candy, jellybeans still intact. One month later, she chewed up a cap gun and developed a hacking cough that sounded like plastic lodged in her throat. An X-ray showed only an irritated esophagus. South Burlington dog Barouk is lucky to live within 20 minutes of BEVS. The nine-year-old yellow lab suffered a seizure on Christmas Eve, endured a violent sneezing fit on Super Bowl Sunday, and leaped off a second-floor roof on the Fourth of July weekend. Something about nights, weekends, and holidays triggers trouble for pets. “They just know,” hospital administrator Whitney Durivage says. Back in February, Barouk devoured two-thirds of a pan of triple-chocolate brownies, an escapade that earned him a required overnight hospital stay. His owner, Danielle Fisette, called to check on him every half-hour. “And the staff were wonderful and kind every time I called,” she says. The flying leap off the roof in his exuberant celebration of Independence Day this summer earned Barouk a splint. He broke no bones but injured his left front paw. He was already getting laser therapy for shoulder tendinopathy, so Dr. Pam Levin expanded the treatment to stimulate healing in Barouk’s paw. BEVS has plans to renovate the existing building in order to create more exam rooms and offices. Renovation is underway, Whitney Durivage says, adding, “We’re kind of at our max capacity.” Rollaway crates and gates create extra hospital beds when supply exceeds demand. And staff dogs have taken over the staff lounge. Six relaxed there one day recently. Bringing your dog to work is a great employee perk, but in the current building, it means that staffers have to share the lounge. They get to use the refrigerator and lockers. Everything else has gone to the dogs, as the saying goes.